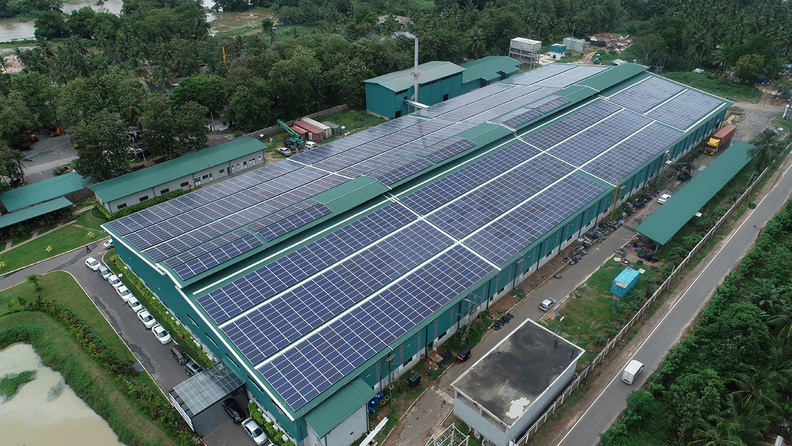 The solar panel system installed at the Sri Lankan tire factory occupies approximately 90,000 square feet on the roof. COLOMBO, Sri Lanka—Specialty tire manufacturer Global Rubber Industries Pvt. Ltd. has installed what it considers to be one of Sri Lanka's largest rooftop solar panel systems at its tire plant in Colombo. The solar panels have a capacity of 1,200kW (1.2MW) and are expected to generate 136,557kWh of electricity per month. It is one of the measures GRI has taken to support the country's initiative to produce 100 percent renewable generated electricity by 2050. The system occupies approximately 90,000 square feet on the roof. GRI said it will generate a monthly revenue of approximately $16,600 once it is connected to the national electricity grid. GRI said the environmental awareness system will help reduce more than 1,100 metric tons of carbon emissions per year, equivalent to more than 20,000 trees that could absorb CO2 annually. In addition to the new system, other green initiatives employed by GRI include a bio-mass boiler for steam generation; rainwater harvesting, tree planting; and natural lighting on factory sidewalls. "This plant is a testament to the spirit and values embodied by all at GRI," said Prabhash Subasinghe, managing director. "GRI's values of purposeful action, relentless drive, far-sighted approach coupled with a discovery mindset are evident in every aspect of this plant." GRI, which has offices in six countries, produces agriculture, construction and materials-handling tires.